A big rig is shown on its side across multiple lanes of the 91 Freeway in Carson at South Main Street following an accident on Tuesday, March 11, 2014. CARSON, Calif. (KABC) -- An overturned big rig shut down multiple lanes on the eastbound 91 Freeway in Carson early Tuesday morning. According to California Highway Patrol Officer Stacy Lee, the big rig lost control while traveling northbound on the 110 Freeway onto the eastbound 91 Freeway transition. The cause of the crash was not immediately known. The incident occurred at around 2:30 a.m. 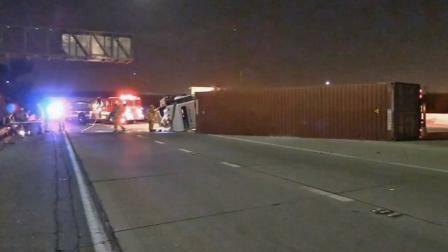 The big rig overturned, shutting down the four right eastbound lanes at South Main Street on the eastbound 91 Freeway. The 110 North transition to the 91 East was also shut down. Lee advised commuters to take Vermont to the eastbound 91 Freeway to avoid the mess. At about 4:30 a.m., crews had the big rig upright. The roads were estimated to reopen by approximately 7 a.m. The big rig was carrying 37,000 pounds of cargo. The driver, described as a man in his 40s, was seen walking at the scene of the crash with a neck brace and an arm sling. He was transported to an area hospital.